Elon Musk Clarifies His Plan to "Nuke Mars"
Filed to: Superhero or Supervillain?Filed to: Superhero or Supervillain? Remember a few weeks back, when Elon Musk explained how we ought to nuke Mars to warm it up? Well, the billionaire was really just speaking off the cuff, and so during a SolarCity launch event in Times Square yesterday, he decided he ought to clarify. 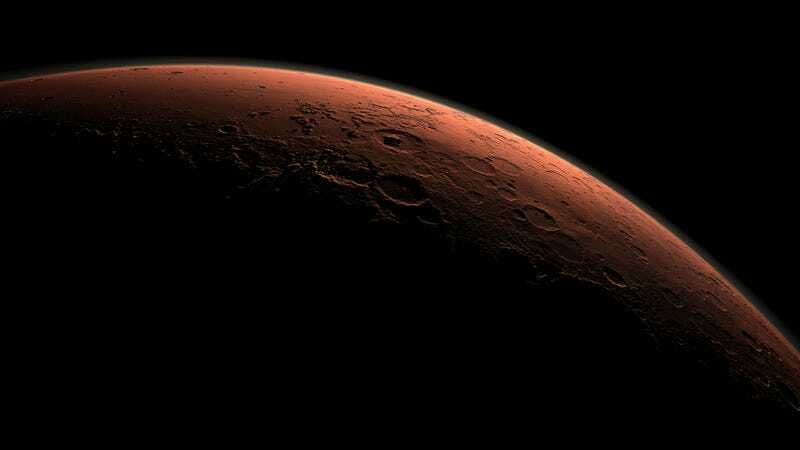 The founder of SpaceX doesn’t want to nuke the surface Red Planet. He wants to use fusion bombs more powerful than any explosives we’ve ever built to blast the sky every few seconds, creating a temporary “sun” over each pole. “What I was talking about,” said Musk, “was having a series of very large, by our standards, but very small by calamity standards, essentially having two tiny pulsing suns over the poles. They’re really above the planet. Not on the planet. “Every several seconds,” Musk continued “send large fusion bombs over the poles. A lot of people don’t appreciate that our sun is a giant fusion explosion,” he added, to a reportedly silent audience. What Musk keeps trying to explain here is a scheme for heating up the surface of Mars quickly, in order to make the planet hospitable to plant life. There’s a lot of carbon dioxide locked up in Mars’ poles as dry ice, and CO2, as we know, is a powerful global warming agent. If we release enough energy over the poles, we might just be able to send all that CO2 skyward, warming the atmosphere enough to kickstart a positive feedback loop and a runaway greenhouse effect. (Check out my detailed explainer on Martian terraforming here). In the end, however, the billionaire’s attempts to explain Martian terraforming to the masses seem to only be solidifying his mad supervillian image. For now, it might be best if Musk stuck with crashing rockets into the ocean.